Byron Bay Writers Festival has been on the road with The Five Writers Road Trip. This adventure involves five writers visiting five towns in five days. I was lucky enough to see the five writers at their fourth stop in the little town of Alstonville. The audience was entertained with book readings, insights into the writing process and a discussion on how readers have responded to their work. The writers included Zohab Zee Kahn, Mark Dapin, Chris Flynn, Lian Hearn and Ellen Van Neervan, with Zachary Jane as MC and chair. Zachary Jane asked the writers about how they researched for their books. Ellen Van Neervan said the research for her book Heat and Light was 20 percent personal experiences, 20 percent observations and 70 percent imagination (with a total of 110 percent, which is what it took to write her book!). Zohab Zee Khan- whose book I Write is a collection of his slam poetry- said that his research comes from living life; what he reads in the paper, hears in conversations and sees on the news. When discussing how the writers felt when their books were published, Lian Hearn said that when her very first book was published many years ago she experienced a strange feeling she described as shame. Her book, which had come from herself, was now outside herself. Mark Dapin and Chris Flynn agreed about this feeling of shame. Dapin said that it’s a cycle of shame and aspiration. He gets good and bad reviews but the bad reviews affect him more and he remembers them. Flynn agreed, saying ‘I used to be suspicious of people who said they liked my book’. Hearn then added that after shame comes affirmation. ‘It’s wonderful to write something that reaches people all over the world. It’s a see-saw, you’re either extremely elated or in the depths of despair’. Ellen Van Neerven’s book Heat and Light reaches young people sometimes. She said ‘I hope this helps them know they aren’t alone, that their difference can also be a strength’. Zohan Zee Kahn also described how he reached people though his love of poetry, motivational speaking and telling stories. He described a moment after performing some poetry, when a woman came and told him ‘I really needed that’. The woman went on to explain that she had been planning on killing herself that weekend, but that hearing Khan had changed her mind. Khan said he went to his car and cried. He explained we are all just people and concluded: ‘There are power in words’. 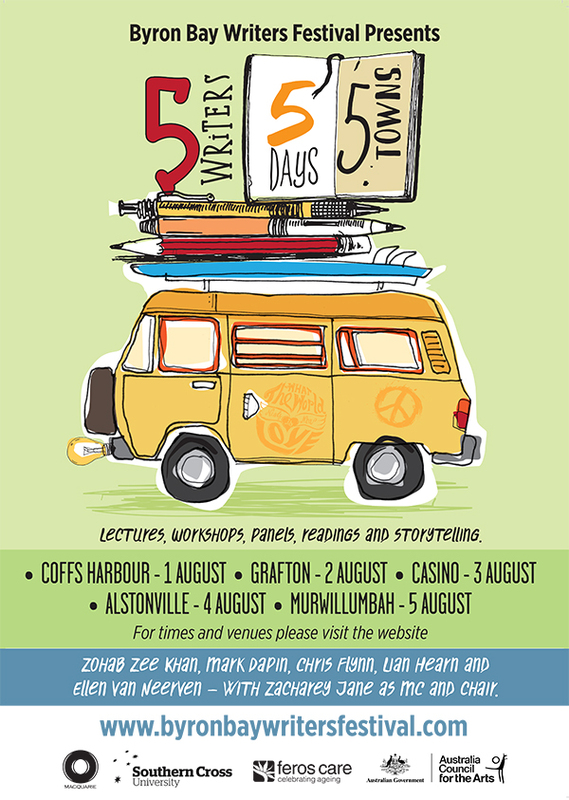 For those in the Northern Rivers you can still see The Five Writers Road Trip at their final stop on 6th August from 7.00-8.30pm at The Hot Wok Restaurant, Murwillumbah Golf Club, 233 Byangum Rd. For bookings call The Hot Wok Restaurant on 6672 4041. Sara Khamkoed is an artist and writer based in The Northern Rivers. She is currently completing a Bachelor Degree in Visual Arts/Secondary Education with a second major in English at Southern Cross University. This entry was posted in Byron Bay Wrtiers Festival, Issue 15, Sara Khamkoed and tagged Byron Bay, Chris Flynn, Ellen Van Neervan, Lian Hearn, Mark Dapin, Zachary Jane, Zohab Zee Kahn by Mark Roberts. Bookmark the permalink.